To introduce my students to the book, Tuesday with Morrie, and the main characters, I had my students close their eyes and listen as I read aloud. “…Afterward, I find Morrie Schwartz, my favorite professor, and introduce him to my parents. He is a small man who takes small steps, as if a strong wind could, at any time, whisk him up into the clouds. In his graduation day robe, looks like a cross between a biblical prophet and a Christmas elf. He has sparkling blue-green eyes, thinning silver hair that spills onto his forehead, big ears, a triangular nose, and tufts of graying eyebrows. Although his teeth are crooked and his lower ones are slanted back–as if someone had once punched them in–when he smiles it’s as if you’d just told him the first joke on earth…Then he hugs me. I feel his thin arms around my back. I am taller than he is, and when he holds me, I feel awkward, older, as if I were the parent and he were the child” (Albom 3-4). After reading, I had the students open their eyes and recall descriptions on a small piece of paper. They were to draw Morrie as they remembered him from the section. They were also asked to write words that they remembered. I read the section again and they added to their pictures. I also read a short section of “The Syllabus” that described Morrie as well. My 10th grade English students come from many different backgrounds and levels of knowledge. My goal for this activity was to meet them at a level they could all reach. 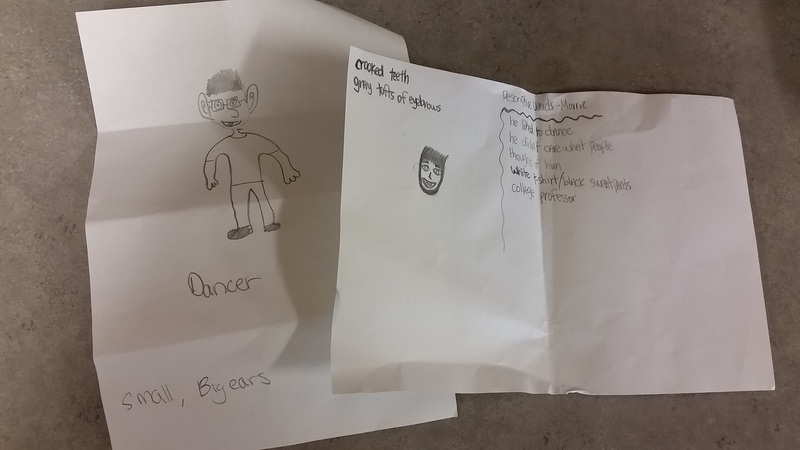 No, they might not all be able to draw well, but they can all draw or write basic words–thus, this assignment was something that could reach all learners and every level of learner development! Plus, it was a fun way to introduce the main character and students could laugh at their pictures when sharing with partners.